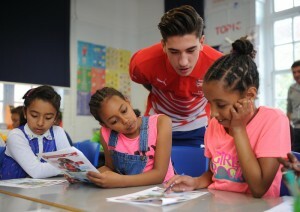 Arsenal Double Club Spanish comprises a wide range of interactive, activity-based learning resources at primary and secondary level developed in cooperation between Arsenal FC and the Education Office of the Spanish Embassy in London. For Intermediate Level resources, simply sign up as a Digital Member and receive free access to our range of online resources. These materials vary from Upper Key Stage 2 right the way through to Key Stage 4, depending on your students’ ability. Resources include downloadable worksheets, authentic texts, videos of native Spanish speaking Arsenal players, PowerPoints and more. These materials will be continually updated throughout the course of the school year, with termly updates communicated on our Twitter page.